Colum McCann loves to spend his days inside the skin of his characters, getting to know them and spinning out their incredible stories. The more unlike McCann they are, the better, he says. He’s a virtuoso, with all the confidence of an Irish storyteller. A stereotype, maybe, but I think there is something to it. In TransAtlantic, McCann is adept at taking on the voices of historical figures like Frederick Douglass, founder of the civil rights movement in America, Arthur Brown, ace flyer and navigator, and Senator George Mitchell, who negotiated the peace talks in Northern Ireland. When he was writing the novel, McCann worked closely with Senator Mitchell’s wife to get the details right, but waited until the manuscript was finished before he actually met Mitchell. McCann writes each chapter from the viewpoint of a different character. He doesn’t write chronologically, but jumps back and forth in time. You have to be willing to go with the flow and accept that you won’t be with any character or confined to a particular time in history for long. After I got used to that, I began to see what a powerful way this is to tell a story. I became immersed in each character’s moment in TransAtlantic, thanks to the vivid, sensual writing. For me, McCann’s sweeping view across time and space casts his characters in a generous, compassionate light. Frederick Douglass and Lily Duggan may feel their lives don’t add up to much, but we see what their sacrifices mean to their descendants. Individuals may be forgotten, but their lives can, indeed, have great meaning, and the consequences of one’s actions can reach around the world and through time. We are all connected. At the same time, I thought about justice and oppression as I read TransAtlantic, and how various groups – Irish Catholics, blacks, women, and others – fight for the same thing. Sometimes they work together, sometimes they are in competition. 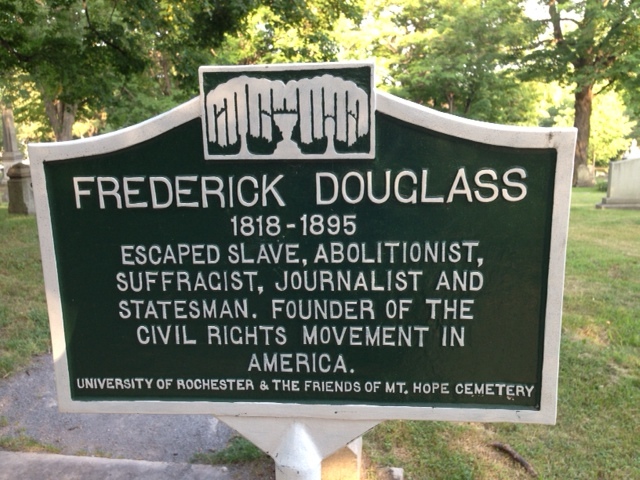 Frederick Douglass is buried in Rochester’s Mt. Hope Cemetery, across from the medical center where I work. In the 1800s, upstate New York was a hotbed of radical abolitionist and women’s suffrage fervor. The civil rights leader Susan B. Anthony lived in Rochester, too, and is buried in Mt. Hope Cemetery. She was friends with Douglass and worked with him on abolitionist and women’s suffrage causes. Yet Anthony and women’s rights activists felt betrayed when black men finally won the right to vote and women did not. Ultimately, Douglass couldn’t hold out for women’s rights. He had to seize the moment when black men in American were given their freedom. In TransAtlantic, McCann writes of Douglass’s trip to Ireland, where he was surprised to discover the Irish suffered under more deplorable conditions than many American slaves. Douglass could fight only one fight at a time, and chose not to speak out against Irish Catholic oppression as he associated with British and privileged Irish dignitaries. 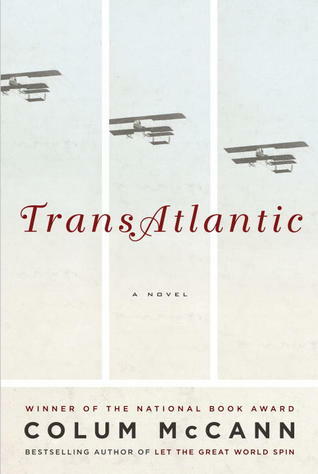 I’m looking forward to hearing what others think of TransAtlantic at our family reunion and which of the inseparable stories embedded in the novel they found most affecting: Senator Mitchell, at age 64 changing his infant son’s diaper before he flies to Belfast. Frederick Douglass deciding whether to take the starving Irish baby. Alcock and Brown praying their Vickers Vimy will make it out of the cloud before they crash into the ground. Lily Duggan washing the bodies of the dead young men. If you’ve read TransAtlantic, please tell us what you think in the comments. 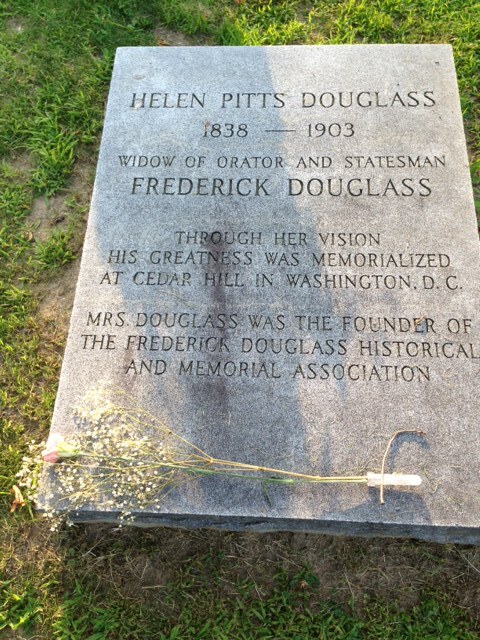 Frederick Douglass’s second wife, Helen Pitts, who came from a prominent Rochester family, was white. After her marriage, her family disowned her. A beautifully written review! This has been on my “to read” list for a while, and now more than ever I’m eager to read it. A wonderful book and pleased to see it nominated yesterday in the Booker Prize longlist. I loved this book and the combination of real historical figures imagined and fictional characters (mostly women) created, McCann is something of a suffragette or feminist as well, acknowledging that women get short shrift in history and recognising the importance of their role. What a joy to have read this with your husband and then for some of your family members to have read it for the reunion, at least that guarantees a conversation starter! So pleased you visited the graves and shared with us the images, that must have made the reading all the more personal to have that connection so near to you, your own TransAtlantic journey, from the graveside to the family reunion, metaphorically speaking. Thanks, Claire. I saw in your post the other day about TransAtlantic being nominated for the Booker Prize. Thanks for listing all the other books nominated, now I have even more to read! I think everyone does, it was a very diverse list so unlikely that many people would have read more than a few, and 5 of the books listed have yet to be published! Beautiful review, Valorie. Lily Duggan looks like a fascinating character in the story. It is interesting that the story moves between different time periods. I used to find that disorienting but I find it interesting these days. It was interesting to know more about Frederick Douglass. It is interesting to know that he fought for women’s suffrage too. I loved your description of the beautiful moments in the novel. Nice to know that you read this book with your husband. It must have been wonderful to share favourite lines and compare notes. Thanks, Vishy. I think if it’s done well, moving between different time periods is so powerful. PS, I’m wondering how I’ve been missing your blog posts for so long. Yes, books can save a life. They certainly kept me sane while growing up in a nest of die-hard philistines who refused to drive their kid to the public library. I fed/read off the books I could buy at Sunday flea markets for a dime and a nickel on the South Side of Chicago. Oh yes, I bought MacBeth in hardback for a nickel when I was in the seventh grade. That was a hell of a find. You know, I think I’m going to turn the rest of my thoughts into a blog post. I hope you do turn your thoughts into a post, because your story is intriguing. If you write more about your reading and growing up, let me know. Thank you! I now feel very vindicated for REFUSING to screw up my story’s time line and other creative spins that a publisher told me to trash because readers are too dumb to follow such things. Clearly YOU are quite capable. I’m glad you liked my comments about the story’s timeline. I think you should follow your instincts as you tell the story, because sometimes we’re smarter than we know. I also think there are so many different publishing outlets these days, writers don’t have to be so bound by this kind of advice. You have to be free to experiment.